Awards: Nominated for Best Picture; Best Supporting Actor-Jack Nicholson; Best Film Editing; Best Sound. 1993. DVD: Widescreen 2.35:1/16x9; audio English DD 5.1 & Dolby Surround, Spanish & French Digital Stereo; subtitles English, Spanish, French, Portuguese, Chinese, Korean, Thai; closed-captioned; single sided - dual layered; 28 chapters; rated R; 138 min. ; $29.95; street date 5/29/01. Supplements: Audio Commentary With Director Rob Reiner; “Code of Conduct” Documentary; “From Stage to Screen” Documentary; Theatrical Trailers; Filmographies; Production Notes. Two Marines stationed at Guantanamo Bay, Cuba, are accused of killing one of their compatriots. A cocky young lawyer named Daniel Kaffee (Tom Cruise) - the son of a legendary litigator - is assigned the case, and he quickly plans to cop a plea bargain. However, another lawyer thinks there’s more going on with the case; JoAnne Galloway (Demi Moore) wants to dig deeper into the events. Since the defendants - Lance Corporal Harold Dawson (Wolfgang Bodison) and Private First Class Louden Downey (James Marshall) - admit their actions but deny guilt, Kaffee has no choice but to take the hard road. Because of this, Kaffee and the others discover that all’s not fine and dandy in the Marine Corps. At the root of the issues stands the base’s commander, Colonel Nathan Jessup (Jack Nicholson). He seems to be deeply involved in the affair, and it’s up to Kaffee and the others to pin down the nature of the events. The murderous Marines don’t deny their involvement, but they indicate that they acted under orders, so the litigators need to find proof of this and discover how high the guilt goes up the chain of command. The core story of AFGM offers nothing special, but the military involvement makes it more interesting. Marines aren’t exactly a casual bunch, so their intensity of commitment to their work means that this will be a more difficult nut to crack. The plot progresses in a logical manner that can seem a little too convenient at times but still holds up fairly well under scrutiny. While the script to AFGM is reasonably intelligent, and director Rob Reiner manages to keep the pacing on an even keel, it’s really the actors who carry the show. That’s somewhat unusual for this kind of piece; courtroom dramas generally are most dependent on their scripts. Aaron Sorkin’s screenplay is definitely a nice piece of work, but I didn’t think it necessarily would have led the film to be a success. Instead, the solid cast ensure that AFGM becomes more compelling than the average legal potboiler. In a way, AFGM seemed to set the stage for Cruise’s next film, 1993’s The Firm. While the two share a background in the legal profession, The Firm had little to do with law itself; the partnership mentioned in the title could have been any of a number of other organizations and the movie would have worked just as well. The connection shared by the two films stemmed from the casting, as both bolstered themselves with very deep groups of professionals. A look through the credits for AFGM finds a stunning roster of talents; in addition to leads Cruise, Nicholson and Moore, we get Kevin Bacon, Kiefer Sutherland, Christopher Guest, J.T. Walsh, Kevin Pollak and others. All of the name actors acquit themselves nicely, with special credit going to Cruise and Nicholson. In regard to Tom, I can’t say that his performance as Kaffee required him to stretch his skills. After all, at that point in his career, Cruise has played about a billion other handsome, slick and cocky professionals who prove their talents after a few periods of self-doubt; does Kaffee really differ from his roles in Top Gun or The Color of Money? Not tremendously, but I thought Cruise added a looseness to the role that suited him well. During his audio commentary, Reiner states that this was the first time Cruise played a role with any humor to it. That statement is preposterously wrong, as most of Cruise’s characters were somewhat flippant and jokey; often their main flaw is that they’re too smirky and willing to laugh at everything and they don’t take things seriously. Hell, Cruise first made his name in Risky Business, which was a comedy; how could Reiner think this essentially-serious role was Cruise’s first comedic part? I don’t know, but I won’t fault Cruise for his director’s memory lapses. Cruise does add a nicely humorous tone to the character when necessary, and he also makes Kaffee fairly believable when it counts. He can overplay some scenes - one drunken tirade came off as too flamboyant - but as a whole, Cruise grounds the film and gives it heart. On the other hand, Nicholson lends power to AFGM. The role of Jessup doesn’t require anything new for Jack, but he adds a weight to the presence that’s virtually invaluable. Jessup is a big-shot in the military, and because of Nicholson’s prominence, we feel this status before he even speaks a line. In one scene, he strides into the courtroom, and Nicholson demonstrates the stature necessary in a powerful manner. Within the lesser-known talents, Wolfgang Bodison is the biggest treat. Apparently he wasn’t an actor. Reiner maintains that Bodison had no performing experience whatsoever, a statement that may not be true; IMDB states that Bodison appeared in a 1984 episode of Murder, She Wrote. However, that website isn’t always correct, and even if this information is right, it still seems clear that Bodison was very inexperienced prior to AFGM. You wouldn’t know that from his work in the film. He provides a terrific presence as Dawson, and he adds life to the role that didn’t exist in the script. The part is small but crucial, and I thought his performance was very professional and he held up nicely in the face of all that star power. Ultimately, I found A Few Good Men to be a fairly solid legal thriller. Almost half of the film takes place within a courtroom, so if you don’t find that sort of action interesting, you’ll likely not care for the flick. However, for those of us who loves the sparring that takes place in court, the movie offers a strong and compelling tale. Backed by a stellar cast, A Few Good Men was a well-made production that suffered from a few small missteps but generally provided a provocative and entertaining affair. A Few Good Men appears in an aspect ratio of approximately 2.35:1 on this single-sided, dual-layered DVD; the image has been enhanced for 16X9 televisions. Though not without some problems, as a whole this was a fine transfer that presented a very solid picture. Sharpness consistently looked excellent. From start to finish, I thought that the movie seemed crisp and well-defined. Even during wide shots, I saw no examples of soft or fuzzy images, as the movie always remained distinct. Moiré effects and jagged edges caused no concerns, but I did note occasional examples of print flaws. Light grain appeared during some low-light shots - primarily those that took place around dusk - while I also saw some grit and speckles during the movie plus a couple of small nicks. The defects were minor, but they did arise from time to time. AFGM featured a naturalistic palette, and the DVD displayed it to good advantage. All of the hues seemed nicely warm and accurate, and I thought the colors came across well. Throughout the film, the tones looked clear and vivid with no signs of any problems. Black levels were also deep and rich without any muddiness, and shadow detail appeared appropriately dense but never thick or heavy. Lose the print flaws and this was an “A”-level transfer, but the various minor defects dropped it to a still-solid “B+”. A Few Good Men offers a subdued but decent Dolby Digital 5.1 soundtrack. Since this wasn’t exactly an action-packed flick, I didn’t anticipate a great deal of activity from the mix, and my expectations were met by this laid-back soundfield. The forward channels displayed nice stereo separation for the film’s score, and a smattering of ambient effects cropped up from the side speakers as well. Actually, I suppose I heard more than just a “smattering” of sound, as the forward environment created a fairly decent atmosphere; at times it could provide some solid elements, such as cars that sped from one speaker to another. Still, there wasn’t a lot for the mix to do, so I’ll stick with my “smattering” judgment. The surrounds were rather passive partners in this equation. From what I could tell, they featured little more than general reinforcement for the music and effects heard in the forward spectrum. As such, though they made the track sound a little more broad and engaging, they didn’t add a whole lot to the experience. Audio quality generally seemed fine. At times speech appeared a little thin, but for the most part I felt that dialogue came across as acceptably natural and distinct, and I heard no problems related to edginess or intelligibility. Effects seemed clear and accurate. Except for one gunshot and some thunder, dynamics were not impressive, but they had no reason to be; the track featured very few elements that pressed the range to perform. Music featured greater depth, however, as Marc Shaiman’s score presented nicely tight and rich bass at times. The music definitely provided the strongest aspects of the soundtrack, as the score sounded warm and crisp throughout the film. Ultimately, although it was a very mild mix, the audio for A Few Good Men aptly complemented the film. 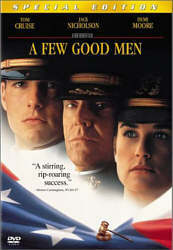 The new special edition DVD of A Few Good Men replaces the old “movie-only” release of the film. I never saw that disc, but apparently it included absolutely no extras; not even the movie’s trailer made the cut. This version rectifies that situation with a variety of new supplements. We start with a screen-specific running audio commentary from director Rob Reiner. I believe the first time Reiner participated in one of these kinds of tracks came along with the old Criterion laserdisc release of This Is Spinal Tap. When his section of that piece began, Reiner indicated that has wasn’t sure he should do it; he felt that his remarks might ruin the cinematic illusion and ultimately harm the experience. I guess old Meathead shed that aversion in the following years, as he now provides audio commentaries for a slew of his films. All of these differ from the Criterion track for Tap, in which Reiner’s statements were edited together with those of a few other participants. During Reiner’s later commentaries, he always works alone and the results are presented “as is”. Unfortunately, these tracks haven’t been pretty. I’ve screened Reiner’s commentaries for The Story of Us, When Harry Met Sally and Stand By Me and they’ve all been serious duds. Reiner’s MO is to sit silently through most of the piece and occasionally offer some fairly obvious or unrevealing information. Expect no deviations from that pattern as Reiner sleeps through AFGM. He rarely speaks, and when he does manage to open his pie-hole, he usually cannot muster any statements more compelling than “He’s/she’s a wonderful actor”. On occasion, Reiner does tell us some moderately informative details; most useful were his indications of changes made from the original play. Otherwise, however, this was yet another drab and lifeless commentary from Reiner. If I sound peeved about this, there’s a good reason: I am really annoyed. After four solo audio commentaries, you’d think someone would have realized that the format just doesn’t work for Reiner and changes would be made. The man desperately needs an interviewer to be present. Would that ensure higher quality? No, but it couldn’t hurt. As it stands, I’m dreading the upcoming special edition of The Princess Bride - I don’t know if I can suffer through another Reiner snoozefest. More pleasant are the two documentaries found on the DVD. First up is “Code Of Conduct”, a general look at the production. During this 34-minute and 45-second program, we get a mix of film clips, production photos, and interviews with participants. For the latter area, the emphasis is on talent that works in front of the camera; in addition to director Reiner and writer Aaron Sorkin, we hear from actors Tom Cruise, Demi Moore, Kevin Bacon, Keifer Sutherland, James Marshall, Wolfgang Bodison, Kevin Pollak, Christopher Guest and Noah Wyle. Most of these snippets seem to be recent recordings; I believe that only the segments with Cruise and Moore come from the early Nineties. As a whole, this was a watchable but unspectacular little piece. I thought there was too much emphasis on the usual “happy talk” that dominated Reiner’s commentary, but the variety of participants made the program seem fairly interesting. It’s good to learn the actors’ perspectives on the film, and a few good anecdotes arise along the way, such as the description of the difficulties Sutherland experienced behind the wheel of a Humvee. It’s a fairly average documentary, but I thought it merited a look. Much more interesting was “From Stage to Screen With Aaron Sorkin and Rob Reiner”. At only 13 minutes and 40 seconds, this program was much shorter than “Code of Conduct” but it offered a lot more concentrated information about the film. Through the usual interview snippets and film clips, we learn the project’s genesis and the path it took to go from a play to a movie. Sorkin dominates the piece and he adds some nice details, such as his crash course in screenwriting. The remainder of the DVD provides some of the usual extras. We get Filmographies for Reiner, Sorkin, and actors Cruise, Nicholson, Moore, Sutherland, Bacon, and Pollak. There are also trailers for AFGM itself plus Cruise’s Jerry Maguire and Moore’s The Juror. Lastly, some brief but decent text Production Notes appear in the DVD’s booklet. These offer a short history of the film’s creation through some quotes from Reiner, Cruise and Moore. Recommendation time, and is often the case with reissued DVDs, my opinion will vary for different parties. Overall, I rather enjoyed A Few Good Men. At 138 minutes, it ran a little long, but most of the film seemed compelling and taut, with only occasional slow spots. I love courtroom dramas, and this one provided a lot of tense legal action that made it endearing to me. Add to that a terrific cast and AFGM was a winning film. The DVD offers very good picture quality alongside sound that seems modest but accurate and a decent roster of extras. If you don’t already have a copy of AFGM, you should be very pleased with this release. However, current owners of the previous movie-only version of AFGM may not want to open their wallets. From what I understand, picture and sound quality on the new DVD seem identical to the old one, and I can’t say that the re-release’s extras dazzled me; I liked one of the two documentaries quite a lot, but the other was a bit drab, and the DVD’s audio commentary from Rob Reiner was an almost-total bore. I don’t think it’s worth shelling out for this DVD just to get a few decent supplements, so current owners should probably just stick with the old disc.